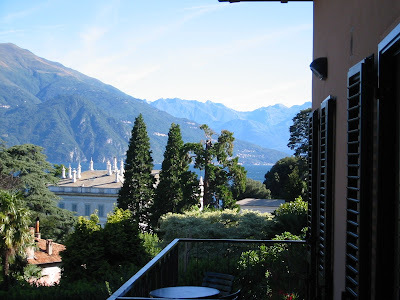 Last week, when I received the "Best of Italy" Wine Spectator issue, two things jumped out at me. Check out the view from the balcony. Not bad for just over $100 a night! Here is a link to the Trip Advisor review of the property. The second thing that I noticed in the magazine was the wine ratings- and one wine in particular. 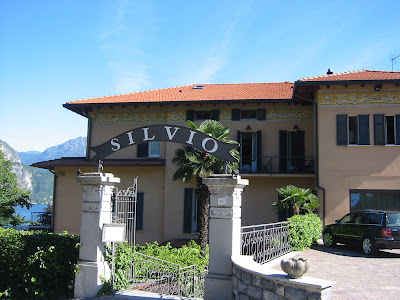 I've found it difficult to find good, affordable Italian wine in the US. I'm not saying Italian wine isn't good- I'm just saying it is very hard to find an enjoyable bottle for less than $20. However, in "James Suckling's Recommended Values from Tuscany" one wine stood out. 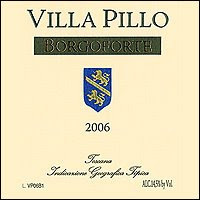 The 2006 Villa Pillo Toscana Borgoforte received 92 Points with a release price of $12. Now *that* is a Quality-to-Price Ratio (QPR) I can get behind! I also received an email from Wine Spectator this morning which featured this wine as part of their free "Sips 'n Tips" newsletter. I placed a few phone calls to local shops asking if they could get it in. None could. With 10,000 cases produced, it would seem that the wine should be readily available. Maybe it just hasn't arrived in the US yet? I also tried searching the web. Vinquire.com and Wine-searcher.com are my current favorites for wine searching. The only place in the US that had this wine according to those sites is Zachys and they've jacked the price up to $19.99. There goes the QPR. I'll keep my eye out for it though- hoping that it shows up in shops later this fall. Update! (10/19/2008): I received a return call from Route 9 Wine & Spirits in Framingham, MA last week letting me know that they had the 2005 vintage of this wine in stock. I stopping in today and picked up 2 bottles for $20. The 2005 received 87 points from Spectator, so theoretically not as great a wine as the 2006, but I thought it was worth trying since it would be more similar than not. I have to say- though the wine was good, it was not great (in my humble opinion). The nose reminded me of the rind of Brie cheese- rather funky and austere. On the palate the wine tasted better than it smelled fortunately and overall it was quite smooth and relatively enjoyable. I dunno- maybe I'm simply not an old world kind of guy. I compared this side by side to a glass of Napa Cab and I far preferred the Cab in every way. Update (12/2/2008): This wine has been turning up at many stores in the US recently. Read more here. Question of the Day: Do you have a hard time finding highly rated Wine Spectator wines?